The commercial kitchen ventilation equipment is an integral part of the overall design and structure of a commercial kitchen. This heavy duty ventilation device is essential in the collection and release to the external environment of stale, impure and humid air from the workstation. The ideal exhaust equipment for the commercial kitchen must have the required power rating and constructed with drive compartments which are completely sealed or enclosed to ensure adequate protection of the air-cooled electric motor. Suffice it to say, you need to find the commercial kitchen ventilation equipment that complies with the health and safety standards for this type of mechanical devices installed in commercial kitchens. Impeller fans are just like the propeller blades of airplanes and this type of fan is found in most exhaust systems of commercial establishments. On the other hand, blower fans are like the hamster wheels and they are usually referred to as squirrel cages. This type of ventilation fan can move air better than the impeller fans. 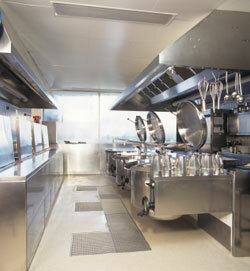 Most commercial kitchen ventilation systems consist of commercial kitchen ventilation fans, hoods and ducting. There are some work stations that are installed with centralized exhaust system, which is composed of several commercial ventilation fans, and draws air from the entire workplace through a network of ducts. There is also a special group of commercial kitchen ventilation fans known as heat recovery ventilator or HRV. This ventilation device is designed as a self-contained exhaust system that maintains a healthy balance between air exhaust and air intake. Oversized or high capacity kitchen ventilation equipment can trigger back draft of the chimney. This condition is characterized by the drawing of air from chimneys, which brings in harmful and highly-combustible gases into the kitchen or indoor working space. You can prevent back draft when you have an air-tight heating appliance. If you are going to install high capacity commercial kitchen ventilation equipment in the workplace, then you must match them with the appropriate makeup air to maintain the balance of house pressures. Most ventilation salespeople and contractors are not even aware of the effects of large-sized ventilation fans on the other kitchen appliances. You have to make sure that you install the kitchen ventilation system properly and that it adequately accounts for makeup air. In addition to this, the kitchen or workstation must be outfitted with detectors and alarms for carbon monoxide and smoke that can warn you if there is a back draft.